Pigs do not share the same center of gravity that people have. Usually, they're front half is where they typically put most of their weight (for lack of better words) and navigating down a flight of steps can be extremely dangerous in a bigger pig, even if this pig has been using these steps their whole lives. Much like people, if a pig falls down the steps, the risk of fracture to a bone is pretty high. And the risk for falling down the steps for pigs is much higher than it is for the standard person. If you do not have any other alternative other than steps, build a ramp. If you can't build a ramp, then try to figure out something to help keep your pig safe. Perhaps a chair lift system would be better suited for you? Or move your pig to an area that doesn't require the use of steps on a daily basis. Pigs have jumped off the sofa and sustained fractures. they have fallen off decks and suffered broken bones. Imagine what falling down the steps could do. Although it is relatively easy to teach your pig how to climb up and down steps, ensuring they're safe when doing so is another story. Some pigs are super agile and can move around rather easily, but some pigs do not possess that same flexibility and have a difficult time climbing up and down ONE step, much less a flight of stairs. 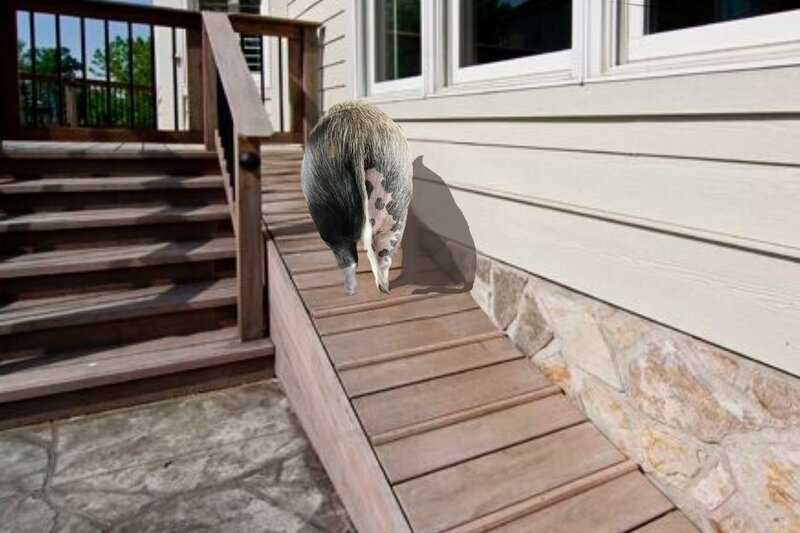 Most piggy parents have installed ramps or purchased ramps for these areas in their homes when multiple steps are involved. Remember as your pig ages, their eyesight doesn't get better, it gets worse...so being able to visualize the next step can be problematic and cause your pig to fall down the stairs. 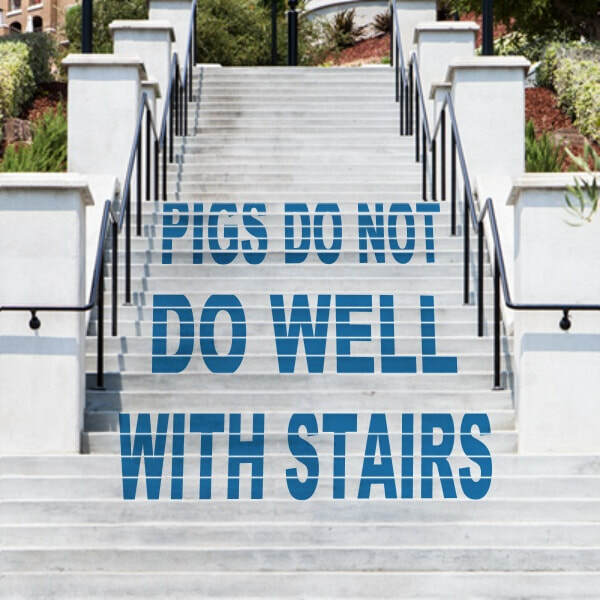 In their natural setting, pigs do not climb stairs, so it is an unnatural process for them to do so in a home. If your pig is overweight, it can literally be impossible for them to get their belly over the step to advance to the next one, sometimes leaving scrapes on their belly from doing this over and over again. Pigs are predisposed to arthritis as well, so knowing that arthritis causes the joints to be achy and sometimes difficult to use, having to climb stairs on the more difficult days can also be problematic for bigger/older pigs. Building a ramp is the best way to ensure your pig is safe versus hoping they'll be able to navigate treacherous stairways. Training your pig to use a ramp is relatively easy in most cases and decreases the risk of your pig having a fall by a long shot. You do need to be sure the angle doesn't pose a risk as well, so extending the overall length past the steps can help you accomplish an angle that doesn't set your pig up for falling. Some pigs will refuse to use stairs for fear of falling and will potty in the house instead of going outside as they've been trained to do. Providing them with the tools to get outside is YOUR responsibility. 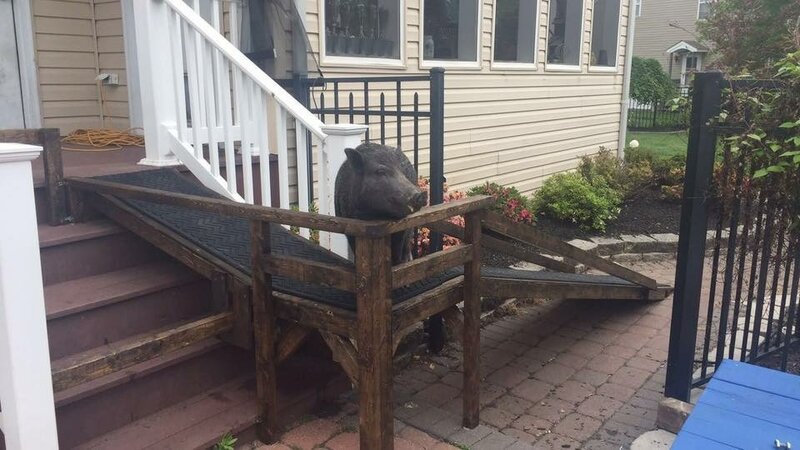 I would have to say, adult pigs shouldn't be expected to use a flight of stairs to get in or out of a house. Between the difficulty in actually navigating them, the poor vision and the overall size? It is an accident waiting to happen. A couple of steps? Sure, that should be ok, but again, a ramp is a much better solution even for a couple of stairs. According to Merck Manual: Fractures of the distal humerus and elbow area and femur are the most common fractures. These occur from jumps off furniture (distal humerus), dog bites (elbow area), restraint (elbow area and femur), equine kicks (femur), and other trauma. Repair via pins, screws, plates, and external devices successfully restores some range of motion if fractures are immobilized properly and any sepsis is controlled, if applicable. Here is a sad story of a pig named Swilber who lived in a basement who may have suffered a fall down the stairs at some point causing him to fear the stairs and no way to get outside before he was brought to live at a pig rescue in NY. Overall, a neglected pig who was starved, living in a basement with natural sunlight. Very sad. Here is a news story where the police were called in to rescue a 400 pound pig left in the basement, no steps, only a ladder. They had to get a tow truck and make a harness to get this pig out of there. http://www.cnn.com/2015/06/28/us/pig-rescued-from-detroit-basement/index.html. These are the type of situations that can be avoided by NOT putting pigs in areas that require skills that pigs do not have, like climbing up a ladder. Xray photo from Pigs Peace Sanctuary showing a fracture in the hip of a piglet named Elsie. X-rays confirmed a break in the right leg. A cast was applied for 6 weeks and once removed, the leg was healed and life went back to normal. No discussion about the cause was made. 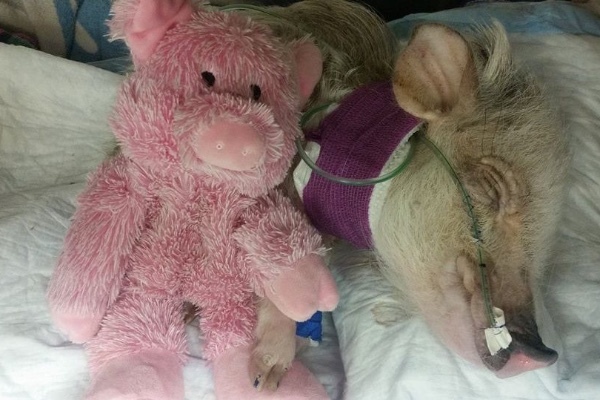 Here is the story of Piper the pig. She was let outside to potty, there was a scream. Her human mama ran out to see what the problem was and found Piper at the bottom on the stairs in the grass. They did not witness the actual fall, but it does not take a genius to figure what happened. If there had been a ramp instead of stairs, would this outcome have been different? No one knows for sure, but odds are, yes. X-rays do not photograph well, so here are the attempts at taking pictures of them. Loki is a pig who was in an unfortunate situation where he sustained a fall and did not receive appropriate (if any) vet care. he was eventually discovered and turned over to a vet in the SC area and a plea for someone to go get him soon ensued because the vet wanted to euthanize him. That was almost a year ago, July 2015. Loki now has a better wheelchair and it was confirmed that he had multiple old fractures that weren't allowed to heal properly set and that he likely did suffer a fall at some point. You can see by this picture his chair was not fit well to his body and did little to no good since he wasn't able to move around using it. 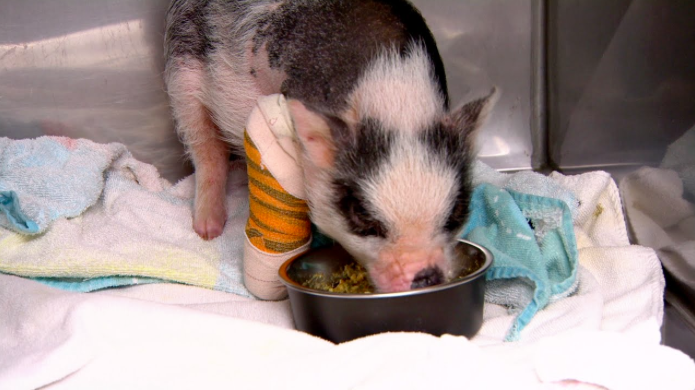 A gofundme was launched for this sweet pig after he fell down the stairs. A very loved pig had an accidental fall and the bills totaled more than 13,000.00 in all. Poor Jeffrey had many complications during his recovery, but if your pig sustains a fall down a flight of steps, there is no telling how your pigs body will react to it either. Here are the details from her initial statement about his fall. "I woke up tuesday to Jeffery flaccid and nonrespondant. He started seizing and went into a coma, with a heart rate of 12. I rushed him to the ER. They told me he would not recover and needed to be euthanized. I told them to keep trying. Jeffery is now breathing on his own and his heart rate is back up. He has been trying his best to pull through but the one thing that will save his life is more time at the ER. He needs a catheter with glucose in it as his levels are to low to read. When he is taken off the glucose he starts to seizure and falls back into a coma. He can't walk yet and he needs to start eating on his own before we can see if he is able to walk, or see again. It's roughly $2k a night so I'm doing what I can but recovery from a trauma like this, he needs to be in their care for at least a week. Anything that can be given to save Jefferys life, no matter how small, makes a difference. Even buying Jeffery extras hours and minuites is appreciated beyond words." She didn't raise the entire amount, but she was able to get some help for the vet bills and I am happy to say Jeffrey made a full recovery and is a happy and healthy pig now. Here is an example of a DIY (do it yourself) ramp to cover 4 stairs leading from a deck to the yard. 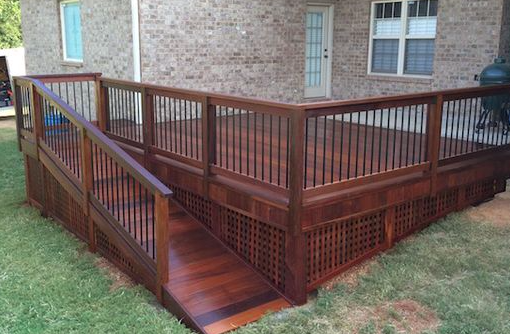 Here is an example of a good ramp that can be purchased in stores or online. Heavy-duty/expandable and lightweight. These can be used to help a pig get in and out of a car/truck/SUV or in the home to cover small sets of stairs. Here is a great example of a ramp for larger breed animals like pigs. Note the comfortable slope and railings on the side to give your pig that sense of security so they don't think they will fall off. This is a well designed ramp. What do you do if your pig has sustained an injury or fracture? A fracture refers to a break or crack in a bone. There are several different types of fractures, and each type has different complications and methods of repair. Your veterinarian can help you decide how best to fix the fracture and if referral to a specialist is in your pig’s best interest. Although splinting will allow a small number of fractures to heal, most will require surgery to ensure the best outcome. Some species of animals always require surgery on foreleg fractures due to the high failure rate of splinting. Click here for additional first aid tips!